Total number of letters, numbers & spaces. Our stock design name boards are solid FEQ teak, measuring 4" high x 23-1/4" long, and 1/2" thick. Letter height is 2-1/2", and the artwork is about 3" tall. Your boat's name will be precisely engraved on our CNC machine -- plus you can choose any of the four engraved-art designs shown in the various examples here at no additional cost. Buy a pair for mounting on your vessel and get a discount. Or get just one name board as a gift for someone special -- or to display in your den or main saloon. Either way, your teak name boards will deliver years of pleasure at an affordable price --and they're a much classier boat-lettering choice than vinyl lettering. Nautical Stars -- A classic look for any vessel, and a favorite of the U.S. Coast Guard vessels we've served. Palm Trees -- Whether you're exploring the South Seas or just dreamin', these boards set the tone for any cruiser. Dolphins -- Who doesn't love a dolphin? Or two or four? 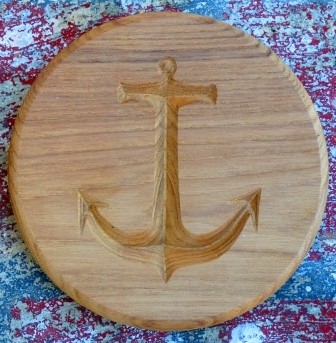 Navy Anchors -- Here's a new and quite salty addition to our stock design artwork choices. You can add more characters/spaces for $10 each, per each name board -- and your name boards will be longer as well, in proportion to the length of the vessel's name.The base price of $99 for a single name board applies to names that have up to 8 letters and/or spaces. This base price also includes the stock-design artwork of your choice. We can also produce your name boards using 1" thick (nominal) teak at an additional cost. If that’s your preference, email john@buckwoodcraft.com with your boat’s name and we’ll send you back a price quote. Or call us direct at 305-743-4090 and we’ll price your requirement right over the phone. Solid First European Quality (FEQ) teak. Name boards are 23-1/4" long x 4" high x 1/2" thick. Letter height: 2-1/2". The name board's end profile will match those shown on this page. Base prices are for name boards with up to 8 letters/spaces. The name board's lettering type font will match that shown on this page. Additional letters/spaces $10 each per name board. Added letters/spaces will increase overall name board length proportionately. Your choice of artwork designs included in base price: Dolphins, Palm Trees, Nautical Stars, or Navy Anchors. Artwork designs are approximately 3" high. 1. You could just apply paint to your boat's lettering, but I think color-tinted epoxy delivers a more durable result. Start by sealing your boat's lettering with clear epoxy and let it set. 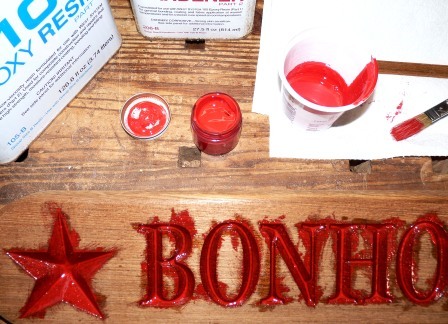 Then, mix the tinting agent into a batch of epoxy until you have the color intensity you want and simply brush the tinted epoxy onto your lettering. Apply 2 or 3 thin coats, 24 hours or more apart for each coat. Don't worry about getting epoxy where you don't want it -- it'll come off later. Coloring agents for epoxy resin are available from several online sources. 2. Once you have your letters colored in the way you want them and you've let the epoxy cure for a couple of days, use a random orbital sander to strip away any excess epoxy/coloring. Use #100 or #120 grit paper to start, then finish with #250 or #320 grit for a ready-to-varnish surface. 3. Now lay down your first coat of varnish, nice and thin to avoid having it build up in your engraved letters. 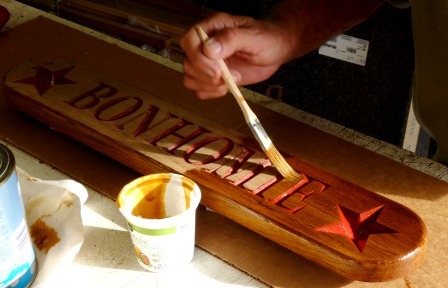 As to the sort of varnish you choose, bear in mind that if your boards are going to live outdoors, they'll need the best UV protection you can give them -- and that's true also for the epoxy-based lettering. Around here we like a product called Sikkens. 4. Let your varnish dry at least 24 hours between coats, and (I know, you already know this) don't apply varnish in direct sunlight or when it's going to rain any time soon. Lightly scuff the cured varnish between each coat with #400 wet/dry sandpaper. All told, you'll want at least four coats, and 6 or 8 would be better. 5. Enjoy. If you're buying a single board as a gift or for displaying anywhere indoors, then you'll never have to worry about replenishing the board's finish over time. If you're installing a pair of boards on your vessel, it'd be a good idea to put a bit of space between the rear of the boards and your mounting surfaces, using nylon washers as shims or whatnot. This will keep varnish-damaging moisture from building up behind the board. Letters colored with gold-leaf pen. Two coats varnish. Letters colored with tinted epoxy. Anchors colored with Krylon gold-leaf pen. Excellent customer service and great quality work. I had an issue with my original order of a name board and buckwoodcraft got right on it and made me another one at no extra cost. Very pleased with both product and the excellent and quick service. I had hoped to be able to order the name boards fully finished with color lettering and varnished boards, but I got someone locally to do that part. I will definitely be using your firm again in the future. Quick delivery, lovely name board, very nice engraving job. I only wish they offered painting/varnish services too. Would definitely buy from them again.